After the birth of Neta’s son Edder and my daughter Gloria in 2010, we were both looking for new cloth diapers. Neta and I had the same concerns with the available brands. All we wanted were good quality, affordable cloth diapers but we were really frustrated that the product we were looking for did not seem to exist. What better solution to our dilemma than to start our own company that would sell amazing quality cloth diapers at a great price? · They’re cheap – Our diapers are half the price of the leading pocket diaper with snaps. And you can just forget disposables! You’ll save a couple thousand dollars by using cloth diapers. If you use your diapers on more than one child you can save double. Just think of how you can spend that extra dough you’ve saved?!? 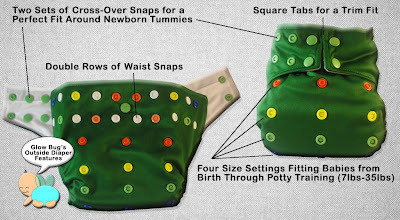 · They’re green – Disposable diapers will take hundreds of year to break down in the dump. The toxic chemicals and human waste in disposable diapers can leach into ground water. Each baby in disposable diapers will produce 1 tonne’s worth of garbage per year! · They’re cute – What’s cuter than the round rump of a cloth diaper baby? They look just like a little Bug! · They’re convenient – You never have to run out in the night to get a pack. Just wash them up when you need them. · They’re trendy – Come on! Everybody’s doing it in Hollywood. Cloth diapering has become a very stylish thing. With so many hot prints in your package, you can release your baby’s inner fashionista! 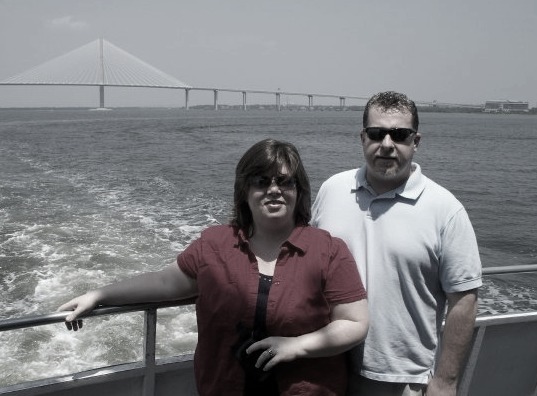 · They’re old-school – Your parents used them and their parents used them. Except now, you can skip the pins and rubber pants. · They’re comfy – Now be honest, wouldn’t you love underwear made out of our super-soft cloth? A lot better than paper disposables, that’s for sure. 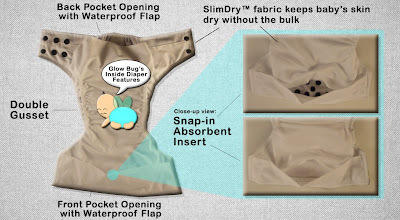 · They’re virtually leak-proof – No more poo-splosions! · They’re not smelly – When they’re washed every other or every third day, like we recommend you’ll never have a stinky diaper pail, let alone a stinky garage in the summer time with hot, rotting disposables in your garbage can. · They’re easy – Like we said, no pins or rubber pants. They go on and off just like disposables! Glow Bug cloth diapers were the first cloth diapers I tried. With Little M I only used disposables and wanted to try cloth on Little H. I have to say cloth diaper have come a long way since I was a baby! When I came across Glow Bug they looked so cute that I had to try them. I was surprised when the cloth diaper came how easy it looked. 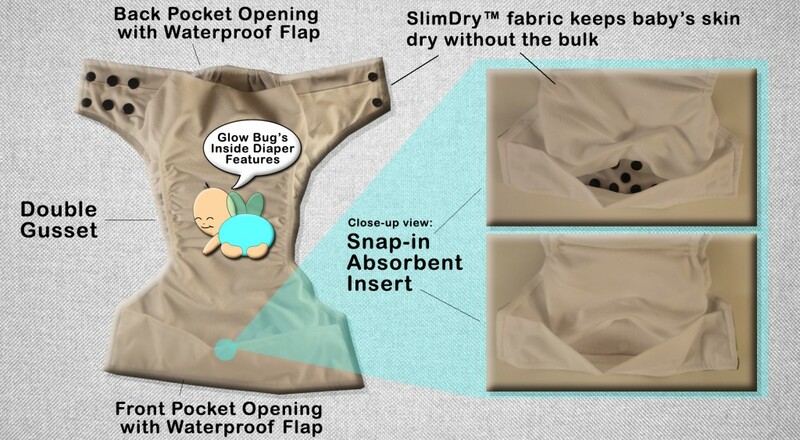 Basically you just snap in the insert then snap the diaper on to your baby and you’re ready to go. Little H 13lbs in green Glow Bug Diaper. One thing I love cloth over disposables is that they do not leak. Most of the time I will change a disposable more often because it leaks out the sides. I also love how soft the cloth diaper is. It is really nice to use cloth when Little H has a diaper rash. I would recommend Glow Bug cloth diapers. They are cute, fit well, don’t leak, affordable and are better for you baby’s skin! You can purchase Glow Bug Cloth Diapers on their website. 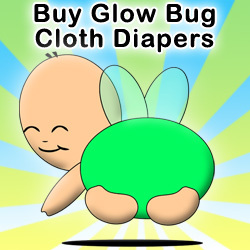 One reader will win their choice of Glow Bug Cloth Diaper! Open to US & CA only 18+. Giveaway will end on 05/01 at 12:01 am EST. Fill out the Rafflecopter form below to be entered! Everyday! We don't use any disposables. I don't currently use cloth diapers. I have a few but they seem to be too big for my daughter. I am looking forward to using them when she gets bigger. Would love to win these! We have one in cloth and one in disposables. We need more cloth to do both kids. I don't know anyone that personally used cloth diapers, so I am very interested in trying them out. Seems it would save a lot of money. Thanks for the giveaway! I plan on cloth diapering from birth. Not had my first child yet, but am planning on it! i've been using cloth for the last 2 months, i've never tried these dipes but LOVE the cute prints!! Not using cloth yet, but I will once the baby gets here in (crosses fingers) two weeks! 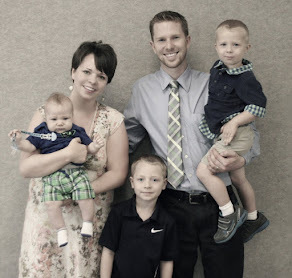 Yes, I started cloth diapering my son when he was 3 months old. It's easier than I thought it would be! I started cloth diapering my 3 year old at night so I could practice for our LO born in February. We just started this year with our one year old, and LOVE it! We don't use cloth diapers but I would love to with our 4 month old son! No i havent used them with either of my two kids, but we have one on the way and im determined to use cloth! I stay home now, where before i worked full time and daycares dont do cloth diapers. so im very much exited to try this time around, and maybe even with my 1 yr old until we get her potty trained! oh and PS, my google+ name is Jesica Goss. it wouldnt let me type it in the spot. I'm still hoping I win!